This video shows the process of creating a profile synchronization connection in Microsoft SharePoint Server 2010. It demonstrates creating a connection to Active Directory Domain Services (AD DS), creating a synchronization filter, and mapping profile properties. The video includes both importing profile properties and exporting profile properties. 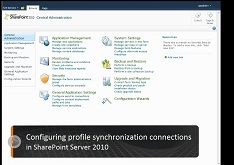 For an optimal viewing experience, download the "Configuring a profile synchronization connection in SharePoint Server 2010" video. This article provides guidance to help you plan how to implement profile synchronization in SharePoint Server 2010. Profile synchronization allows you to create user profiles by importing information from other systems that are used in your organization. Configuring profile synchronization is a process that involves many steps. This article divides the process into shorter phases, both so that you can see progress and to reduce the number of steps through which you have to backtrack if you make an error. Depending on your organization's needs, you may not have to implement all of the phases.